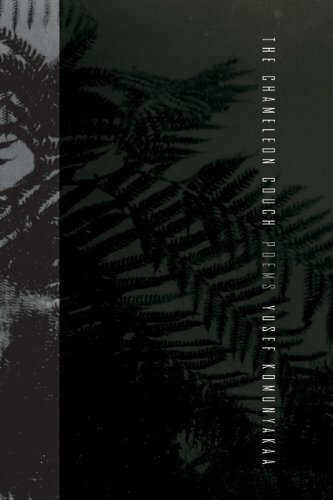 Three poetry collections show us who we are. Sixty-one years ago, Adrienne Rich's first book, A Change of World, won the Yale Series of Younger Poets Award. W. H. Auden selected it—he later also would introduce such poets as W. S. Merwin and John Ashbery via the Yale Younger—and wrote in the introduction: "Miss Rich, who is, I understand, twenty-one years old, displays a modesty not so common at that age, which disclaims any extraordinary vision, and a love for her medium, a determination to ensure that whatever she writes shall, at least, not be shoddily made." 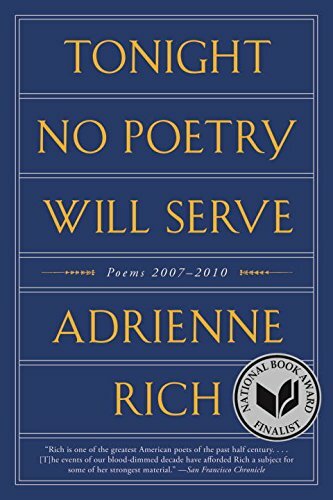 Auden writes that if reading a poem can be compared to "encountering a person," Rich's poems "are neatly and modestly dressed, speak quietly but do not mumble, respect their elders but are not cowed by them, and do not tell fibs." Her poetry, he argues, resists the Modernist mandate to "make it new," instead employing the kind of plainspoken realism Americans love. Auden apparently felt the same relief reading Rich that many had felt when they discovered Robert Lowell's Lord Weary's Castle, published five years earlier. Tonight No Poetry Will Serve brings the same relief, with lines that make sense, poems that describe recognizable situations, music located within the natural cadence of American English. "There's a tune," Rich writes in the book's first poem, "'Neglect of Sorrow' / I've heard it hummed or strummed / my whole life long / in many a corridor / waiting for tomorrow / long after tomorrow / should've come." Beautiful how she resists the obvious rhyme of "song" and "long" but indulges in "sorrow" and two instances of "tomorrow." The music is patent but selective. The tune is quiet, its message wistful but too philosophical to seem sentimental. "Benjamin Revisited" begins: "The angel / of history is / flown," and in its place a shirtless janitor who "has the job of stoking / the so-called past / into the so-called present." What happens in time? "There'll be turbulence," begins a later poem, "You'll drop / your book to hold your / water bottle steady." But there is also love, true love, as in "Emergency Clinic": "I won't smile / while wiping / your tears / I do not give / simplehearted love and nor / allow you simply love me." Rodney Jones might be classified the same way, at least in terms of his inveterate Americanness, which in his case is oblique and Southern. 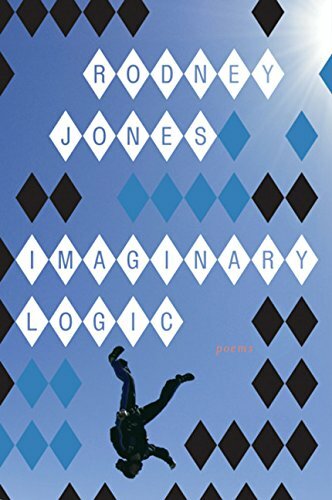 Jones, as those of us who've read him down the years will attest, drives a poem hard and misses no detail. He grinds English for all its music, makes a point of telling no lies, and Imaginary Logic is his finest book in years. "The chief wonders of civilization were lies," begins "The Elementary Principles of Rhetoric"; "How else inveigle behemoths to work / and not split the gentle prophet's skull? / Newborns, maybe the first week, tell the truth." Though these truths come "streaming out of baby monitors" they echo, he writes in a later poem, "long after the talking / ends" and "ghost / inside you in layers / like the voices you remember … / on ancient telephones." Concentric circles of loss surround the speaker of these poems, who in one particularly powerful moment confesses, "Over time it occurs to me / I am building a shed that will burn." This image leads to a moment of conviction reminiscent of T. S. Eliot's Four Quartets: "What I do not know is here. / I worship wood and the instant. / What is over, I can never finish." More accurately, these lines evince Ecclesiastes. Only in this uncertainty do our stories unfold in all their wrinkled glory, as the long poem close to the end of the book, "The Trip to Opelika," aptly demonstrates. Equally ruminative but substituting magical jazz for gritty narrative detail are the poems of Yusef Komunyakaa. Under the influence of such masters as Neruda and Vallejo, perhaps, Komunyakaa breathes the poems of The Chameleon Couch like smoke into the moonlight. Alternately idyllic—"I made love to you, & it loomed there. / We sat on the small veranda of the cottage, / & listened hours to the sea talk"—and urbane—"'Will o' the Wisp' / floats out of Miles' trumpet, / leaning ghosts against nighttime's / backdrop of neon"—these poems apply the same soft touch, reveal the same necessary halo around each situation they describe. They labor not at all to find their soul. They seem, like Rich's, patently normal, never overreaching. As in all great literature, these poems' symbolic power seems to be exercised effortlessly. The reader encounters something that's already there and is happy to encounter again. And everywhere are traces of a deeper, even mythic past. "Raymond rubs his eyes & wonders / why the television's so damn loud," Komunyakaa writes in a poem near the end of the collection; "Where is he? There's a perfume / that goes back to the island of Kos, / to the pillar." What connects these three poets is not merely the certainty of their terms, nor is it their Americanness in a larger sense. The connection is in their sense of music, which is subtle but ever-present, transcendent, making art of what we hear every day. To return to Auden's analogy, the poems in these three books are people you'll want to meet. And in this poetry landscape, that's welcome news. Aaron Belz lives in Hillsborough, North Carolina. He is the author of two books of poetry, The Bird Hoverer (BlazeVOX, 2007) and Lovely, Raspberry (Persea, 2010); a third is forthcoming from Persea.